Metrobús Line 3 begins operations. Photo via CTS-México. Translated from Spanish via ctsmexico.org. Mexico City’s Metrobús launched Line 3 on Tuesday. The trunk line of the city’s five-year-old BRT system is expected to move 120,000 passengers per day between Tenayuca and Etiopía. With the completion of Line 3, Mexico City is now home to 67 kilometers of dedicated busways, 113 stations and 280 buses, moving 620,000 passengers per day and reducing an estimated 100,000 tons of carbon dioxide emissions every year. Line 3 of Metrobus is different than the other routes because the separated bus lanes are paved with concrete on major streets like Vallejo, Balderas and Guerrero. “It is the most extensive concrete application in the city and will last up to 80 years,” Ebrard said. Like other parts of the system, the new stations are fully accessible for those with limited mobility, and they feature good lighting and closed circuit TV cameras for security. Metrobús Director Guillermo Calderón said that the new line will serve about 120,000 passengers per day, adding up to 32 million trips per year on the BRT system. The new system will “connect with the backbone of our public transport system: the metro,” he said. With the additional line, the city hopes to convert car users to regular BRT riders. Fifteen percent of passengers on Line 1 and Line 2 have left their cars at home. 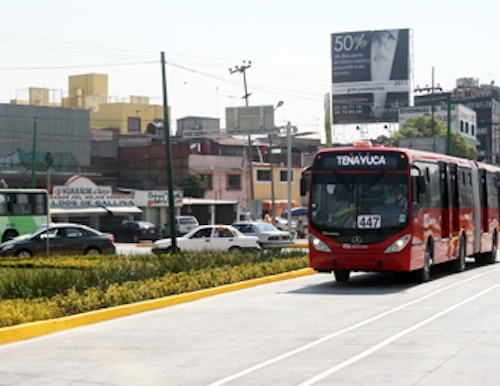 “With this new BRT line, we expect to reduce up to 100,000 car trips per day,” Calderón said. On Tuesday, the trips on Line 3 were free, so users could get to know the route and enjoy the system. Other notable guests who attended the inauguration ceremony included Secretary of Transport and Roads Armando Quintero and the Chairman of the Committee of Governors of the Federal District Legislative Assembly Alejandra Barrales. The Center for Sustainable Transport in Mexico (CTS-México,) a member of the EMBARQ Network (the producer of this blog) helped to launch and implement the first line of Metrobús on Insurgentes Avenue. The organization has since provided input on design, implementation and operations for the past five years. For the most recent addition to the city’s BRT, EMBARQ provided technical expertise on safety improvements along the corridor. To read more about EMBARQ’s role, click here.